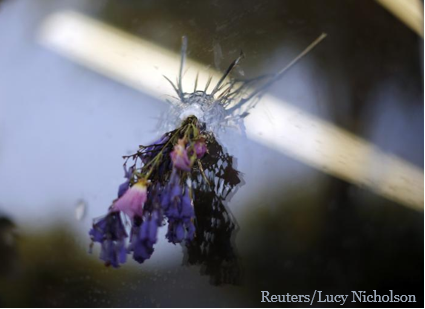 Flowers were wedged into bullet holes in the deli window. This sentence is from a CNN description of the deli where Elliot Rodger shot Christopher Michael-Martinez because he was in the wrong place at the wrong time. It was that random. It was that final. If you drive along the highway in Wyoming or Montana, every few miles there are makeshift altars. Places where people were killed and their families have paid tribute at the point of departure. I have always thought that this custom of wedging flowers into bullet holes or tying them to a tree by the highway was incredibly beautiful. We turn the actual point of departure into a sacred space. We create a shrine to help us remember and honor the life of someone who disappeared in an instant. All weekend I have been reading the stories of what unfolded in Isla Vista. The sad lonely life of Elliot Rodger, the signs that in hindsight look like a road map of madness. I think of the police officers who went to his home at his mother’s request and saw nothing but a strange and disenfranchised young man. In our society, disconnection is not a crime. I think of how those officers feel as they watch their children play, as they wonder if they could have prevented his carnage. I think about the parents of the kids whose lives were ended or are forever changed through physical or emotional trauma. I think about how after Newtown we all swore never again, and yet here we are. More flowers wedged into bullet holes, more grieving parents, more makeshift altars, more promises that this is it, we will not stand for it anymore. We live in a country where it is easier to buy a gun than to access appropriate mental healthcare. Where young people move far away from their families and can spiral out of control well beyond the reach of support. Until they commit a crime, their families are almost powerless to have them hospitalized. Just ask James Holmes’ parents, whose son dressed like the Joker and slaughtered people in a movie theater. Our lives are as fragile as the window of the deli. They are held in place by the structures we create, but in the blink of an eye it can all be shattered. Let your heart hurt over what happened at UCSB. Don’t second guess the parents or the authorities; we always do this as if to assure ourselves that if we were in the same situation we would have done something differently. Just spend a few minutes today really sitting with what it means to have to wedge flowers in bullet holes. I hope that this is the last time. I hope that we are finished with altars outside schools and along our city streets and highways. It is time to be horrified and not become distracted. It is time to make changes in the way we treat each other, especially our most vulnerable. Rather than arming teachers, let’s train them to properly identify and support kids on the outskirts. We come together in times of tragedy, every day there are images of students leaning on each other for support. What if we could be that open and loving towards each other without having to have our hearts broken first. In Shambhala Buddhism there is a teaching, Genuine Heart of Sadness. It describes the experience of being awake enough to feel deeply and compassionately for all beings. That is what we need right now.